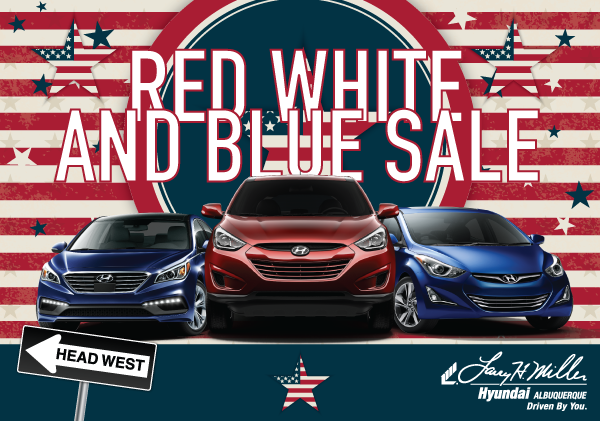 Donâ€™t miss our huge selection of new Hyundais at low prices during our Red White and Blue Sale this weekend only! See below for just a few of the amazing deals weâ€™ll be offering during this limited time sale. *Limit one $10 Target Gift Card per car appraisal. No purchase necessary. See dealer for complete details. Expires 7/12/15. **Based on Black BookÂ® values. Estimated Black Book market value is based on base trim level in average condition. If the lien amount of your trade-in vehicle is more than the Actual Cash Value (ACV) of the vehicle, then you may be responsible for the difference. Vehicles with lien amounts exceeding ACV may require a supplemental down payment. All reconditioning cost will be subtracted from trade allowance, such as excessive mileage, body damage, interior damage, non-working equipment, as well as general condition of vehicle. Offer limited to one trade-in per purchase. This offer is not valid with any other advertised offer. Trade-ins with negative equity may require additional fees. Only a visual inspection of your vehicle will determine its actual value.